100% Ethiopian Cotton Canvas, Leather and Horn details. Great style that is very practical. This nifty little bag is a new addition to our line of quality, ethically sound, cotton canvas bags, beautifully handcrafted in Ethiopia. The cotton is primarily sourced from small farmers in Central Ethiopia. It is naturally colored using pigments extracted from soil and charcoal. The leather is vegetable tanned. The patterned fabrics are screen printed by hand using ancient techniques. 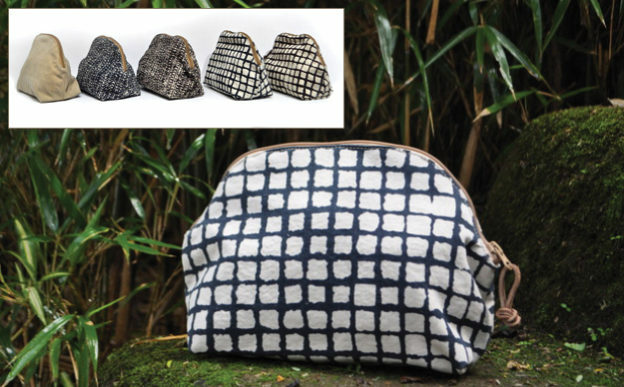 Our cosmetic bag coordinates with our Safari Tote and travel pouch or is great selling as a stand alone, versatile,bag. Zipper at the top and is fully lined and has with leather and horn detailing. You can Spot wash with sponge.